LottosOnline felt like a mixed bag to me – but there’s enough positives here for me to recommend them. Let’s get this out of the way: Most of what LottosOnline offers is hardly groundbreaking stuff. In fact, a large part of their offerings is disappointingly lacking compared to other lottery sites. They offer less than 15 lottery games; a slew of payment methods isn’t accepted; and you can’t even participate in group play or raffles. On the other hand, you can save by quite a bit thanks to their multi-draw discounts and VIP program. And because they don’t take commissions from your winnings, you get to keep more of your prize after taxes. Plus, you don’t even have to travel in order to claim your prize; they do all the heavy lifting for you. On top of that, you’re getting a simple, no-frills lottery site that makes the entire experience a breeze from start to finish. LottosOnline lags behind a lot of their competition in terms game selection and variety. They currently only have 10 lottery games on offer, which is still a decent collection, mind you. But considering a lot of their competitors offer 15 or more games, LottosOnline’s offerings are pretty small in comparison. They also don’t offer any syndicates, millionaire raffles, or even virtual scratch cards. On the bright side, their lottery games include some of the more popular ones, like US Powerball and Mega Millions. LottosOnline claims they have the lowest ticket prices, but that doesn’t seem to be the case. Compared with theLotter – whose prices tend to be pricier than most – LottosOnline manages to be slightly more expensive. A 3-line US Powerball purchase, for instance, costs $15.06 at theLotter, while it costs €14.40 (or $17.01) at LottosOnline. Meanwhile, a 5-line Mega Millions entry costs $12.70 at theLotter, while it costs €12.00 (or $14.18) at LottosOnline. LottosOnline makes it easy to track your money, but it’s undercut by severely limited banking options. LottosOnline splits your account wallet into three: The Account Balance wallet, Winnings wallet, and Rewards wallet. Rewards is where bonus or promotion money, which you can use to buy tickets, go. It’s a really simple and well thought out system. It’s a shame, however, that LottosOnline makes it difficult for those who don’t have Visa or MasterCard to play lottery. Beyond those two payment methods, LottosOnline does not accept any other method. They do let you choose how you want to pay though: top up your account balance, or pay directly via your credit or debit card at checkout. Meanwhile, as far as withdrawal options go, you can only withdraw via bank transfer. LottosOnline is pretty safe, though don’t expect to get detailed information regarding the security measures they employ. Beyond using Symantec SSL encryption to protect both their database and website, there’s no other information to be gleaned from their website in terms of security. It’s also unclear whether they are regulated by a gambling commission. Thankfully, they do have a pretty solid payout record, so that’s a plus. LottosOnline serves up more-than-adequate help resources. For self-help purposes, their FAQ section is meaty enough to satisfy most inquiries. Should you need direct assistance, it’s easy to contact LottosOnline’s agents via email and phone (sadly, no live chat option is available). Take note, however, that these aren’t 24/7 help lines. You can only contact them every Monday to Friday, from 10am to 5pm GMT + 2. For all of LottosOnline’s shortcomings, their education materials are surprisingly comprehensive. When do online Mega Millions lottery tickets need to be bought by? How do I win Mega Millions? Can I play Mega Millions from outside America? How much is the tax for non-US residents? LottosOnline’s website offers a simple experience. Some people might struggle with it though. If you’ve been around the online lottery block, there’s really nothing that you haven’t seen here. LottosOnline’s resembles that of most of its ilk – it’s functionally similar, as well. The latest lottery jackpots are displayed front and center when you enter their website, while more details about their service can be seen when you scroll down. All pretty standard stuff. This simplicity makes it a pick-up-and-play process for newcomers and veterans alike. That is, if you are fluent in English. LottosOnline doesn’t offer multi-language options, so you can’t just switch to another website language if you’re English is rusty. Like most lottery sites, this one welcomes players from all over the globe, so it’s rather disappointing that they lack other language options aside from English. Another bit of disappointing news: LottosOnline does not have a dedicated mobile app you can download for on-the-go play. Their website is optimized for mobile though, but it still doesn’t beat the convenience of a dedicated mobile app. LottosOnline’s VIP program differs from those offered by other lottery sites, which is both a good and bad thing. It works like this: Every time you spend at least €50 within a 30-day period, you automatically get VIP status. This means that, for the next 30 days, you are entitled to a 10% cash back on all purchases. That’s the good news. The bad news is that, once the 30-day period is over and you haven’t spent another €50 or more, then you lose your VIP status. In other words, you have to keep spending at least €50 to maintain VIP status at LottosOnline. In other lottery sites, you need only spend some amount once to get in the VIP program. Plus, once you climb the tiers, you get deeper discounts. LottosOnline’s take isn’t terrible though; I think it’s actually quite clever. I’m just not completely sold on spending €50 or more every time I want to get the VIP perks. Then again, if you’re a frequent lotto player, maintaining VIP status should be a piece of cake. Registering for a free LottosOnline account is pretty quick and easy – it takes less than 5 minutes! 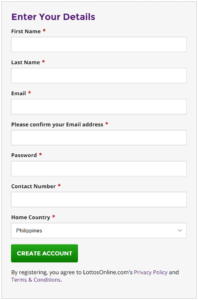 Click on the green “Open Account” button located at the upper right corner of the LottosOnline website. Enter your first and last names, email address, password, contact number and country on the fields provided. Click on the green “Create Account” button. 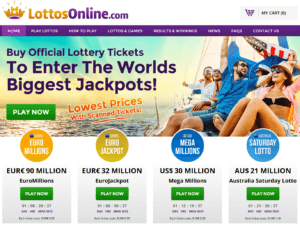 Playing lottery on LottosOnline works much like any other lottery site – but with some minor additions to the formula. Log in to your LottosOnline account – or do this later if you want. Pick the lottery game of your choice. Pick your numbers manually or randomly via the Quick Pick option. Pretty standard stuff so far, right? Now, here is where it gets interesting. Pick the draw date you prefer to participate in. You can leave it as is, or choose to participate in a draw as far as four months from now, for example. Choose if you want a single draw entry, or a multi-draw entry. Multi-draw entries give you at least a 10% discount – and it gets deeper the more draws you choose. Click on the green “Buy Tickets” button, confirm your payment method, and you’re done! LottosOnline makes claiming prizes an absolute breeze for players. At other lottery sites, prizes beyond a threshold – say, $500-$600 – would have to be claimed in person. This means that you would have to travel to the lottery operator’s home country. LottosOnline, however, does all the heavy lifting for you. This means that LottosOnline will claim your prize for you and immediately deposit it to your account, regardless of how much you won. Oh, and did I mention that they don’t take commissions from your winnings? They also send out automatic notifications via email so you don’t have to keep checking the results on their website every now and then. They definitely make it easy for winners. If you can’t live with LottosOnline’s shortcomings, you might want to check out these other lottery sites. theLotter has 5 times the number of lottery games! theLotter is king when it comes to number of lottery games. They currently offer over 53 games from all over the world. Plus, they also have syndicate games. You can even get the best of both worlds, thanks to their lottery bundle packages. They accept tons of payment methods. theLotter currently accepts over 29 payment methods for deposits, and 7 methods for withdrawals. The prices are better than LottosOnline, but still pricey. Their ticket prices are cheaper than LottosOnline’s, but, thanks to handling fees, they are still quite expensive. On top of regular lottery games, WinTrillions also offers syndicates, millionaire raffles, and raffle syndicates. They accept more payment methods than LottosOnline! WinTrillions accepts a whopping 32 different payment methods, which makes it easier for just about anyone to join a lottery game. They even accept Bitcoin payments! Unfortunately, WinTrillions only lets you purchase entries to multiple draws. Expect to invest quite a bit of money here as a result. Like WinTrillions, LottoKings offers 19 lottery games for you to choose from. Syndicates and millionaire raffles are available, too. LottoKings has easy prize claiming. Like LottosOnline, LottoKings makes it easy for winners to claim their prizes. You can either collect your prize by way of check, at a LottoKings office near you, or in person. They don’t scan tickets though. It depends entirely on what you are looking for in a lottery site. Like I said before, LottosOnline is a rather mixed bag. On one hand, you’re getting a simple lottery site that doesn’t take commissions; offers multi-draw discounts; makes prize claiming a breeze; and has good security. On the other, game variety and accepted payment methods are severely lacking. There’s definitely something worth recommending here though, but the shortcomings make it difficult to wholeheartedly give LottosOnline two thumbs up. I will say this though: If you’re just looking to purchase entries to regular lottery games, this site can definitely deliver. But if you’re itching to play in a wide variety of games, or if you are using a payment method other than Visa or MasterCard, you might want to look elsewhere. LottosOnline offers a lottery agent service wherein they purchase actual lottery tickets on your behalf. The Cyprus-based company is a trade name of Marvicap Limited, and was founded in 2015. Why do the cost of tickets increase when Christmas comes around it can’t be because of exchange rates. It might be a simple case of supply and demand, Chris. Lots of people feel like trying their luck during the holidays. If you’re talking about Christmas raffles like Spain’s, though, then ticket prices are naturally higher for those.